It is NOT possible to delete a staff account in HappyFox. As an alternative, you can deactivate a particular agents. What does deactivating an agent mean? An agent can no longer access the HappyFox agent portal. The agent will no longer be considered for ticket assignments. If the agent was part of any filter or\ queue conditions, it will no longer include the agent. Who can deactivate an agent? Any agent with “Manage Agents” permission can deactivate another. One cannot deactivate oneself or account admin. Account admin can never be deactivated. To deactivate account admin, you need to make another agent account admin, and then proceed with deactivating. Choose Manage >> Agents from the module switcher. 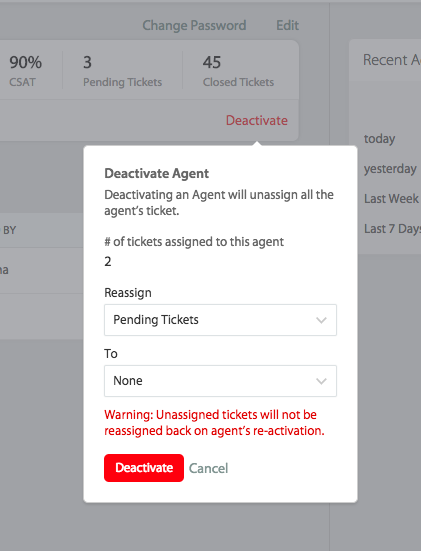 Choose the desired agent from the agent list page to navigate to their details page and click on the “Deactivate” option. Reassign all “Pending” ticket to another agent/none. Reassign “All” tickets to another agent/none. Note: If your agent is part of any workflows, then you would be prompted to edit those workflows to remove the agent before deactivating them. Click on “Deactivate” to deactivate the agent. If you are using HappyFox classic, refer to the attached document.